I have been pleased with how Gigapixel works on normal images with moderate upsizing. I tested it using some recent cropped birding photos and was surprised at how the upsized version looked when compared to the original - the detail was so good that I could not tell that the images had been resized at all. Since the new version was supposed to take care of how poorly the original app did with high ISO images I decided to rerun my original tests using the same high ISO images I used in my original posting on the subject and was a bit disappointed. The Moderate setting produced images that were basically the same as those from the original app and the Strong setting produced washed out colors that needed to be fixed in Photoshop. Here is an image that I combined from the original app and the new one with the new version at the top and the original on the bottom. Both were processed from he original raw using the same color profile, using the High Quality setting and 150% resizing. While I think the upsizing functionality is great I think that high ISO images will have to be fixed before using Gigapixel as it just does not seem to do as good a job at that as I would have thought it might and the washed out colors and the image softness from the Strong processing required quite a bit of work to fix, and I was unable to do much about the resulting image softness. i agree that Gigapixel does wash out the color but it really makes no sense to upscale a raw photo (except as a test). It is far better to develop and process a photo then upscale the result from a jpeg or tiff file (I recommend jpeg). The result will be good. As for noise reduction, there is DeNoise 6 or Reduce Noise from Topaz (Reduce noise does work well) and other noise reduction from different vendors. Have you compared Reduce Noise in Studio against Gigapixel on a jpeg file? 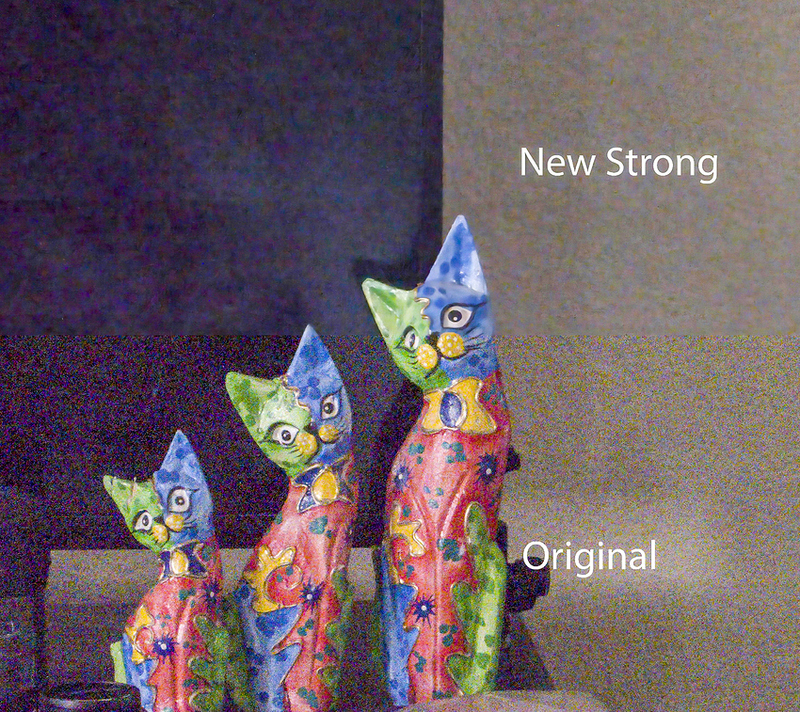 I originally did this test to see how well the noise reduction functionality worked in Gigapixel. Of course I could have processed the raw image through PhotoLab (my workflow choice) and used its Prime NR functionality, but the idea was to compare that NR functionality against the one built into Gigapixel, so I used the raw image. Since this version was supposed to have improved the NR functionality (and it did) I reran the test to compare the old version against the new. While I generally agree that images should first be processed, including cropping, before sending to Gigapixel I guess I disagree that it makes no sense to upscale the original raw image. It contains the most information and so upscaling should benefit from the extra information in the raw image. Using an 8 bit jpg or a 16 bit tiff instead means the loss of some image information and the resulting upscale should be marginally less accurate. The marginal difference might not make any visible difference, but then again it might if someone was doing a particularly large upscale.